When a band claims to be inspired mostly by Christian metalcore bands that were not even around before the turn of the millennium, I obviously am quite the sceptic at first. Elysion Fields are a young metal band from Chicago whose musical influences are As I Lay Dying, The Devil Wears Prada and August Burns Red. This means that they probably attract a rather young audience. I have to admit that I can’t really discern the differences between all the new directions of metal (metalcore, deathcore, emo, screamo,…), but I decided to keep an open mind and try to understand New Beginnings with the metal vocabulary I grew up with. 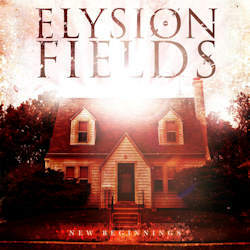 So basically, Elysion Fields play strongly thrash flavoured metalcore which certainly sounds very contemporary, but should have enough guts to even appeal to the metal loving parents of today’s younger generation. The two guitarists Josh and Scotty share the vocals which end up being incredibly varied, with the screams and growls dominating the verses while the choruses often surprise with incredibly catchy, clean sung parts. Occasionally, like on the short Maroon, there is even a pleasant hint of grindcore showing up, proving that despite their tender age, the members of Elysian Fields have seemingly no stylistic boundaries. I am especially impressed by the way the musicians are able to infuse melodic guitar lines to their otherwise quite raw metal sound. Even the two short instrumentals Adapt and Halcyon don’t disturb, yes even help to increase the dramatic momentum of the music. Add to this a flawless, powerful production, and you are in the presence of a self released debut album which is by no means any less pleasant that those of the slightly older bands they have been inspired by. The first ten songs (including the two instrumentals) make up the regular part of the album, but then we are treated with three additional bonus tracks that must have been left over from a previous session and frankly feel just as good to me as the preceding tracks. With the right amount of well placed publicity, this highly promising young metal(core) band should have no problem making it to the top of their league. Let’s hope that their target audience will be receptive and give Elysion Fields the success they deserve.